Ever been to a supermarket that was independent but felt like a big-chain store? That's the feeling I got here at City Supermarket. It's not a particularly bad or good thing, just unexpected. I guess it makes sense because this store location was built as a Stop & Shop in the 1960s or 70s, then acquired by A&P in 1980. A&P closed in the 1990s, and it became a Foodtown owned by the LaRacca brothers, who also own the Foodtown of Lake Hiawatha. Foodtown closed some time around 2008, being replaced soon after by a Super Fine Fare supermarket, which in turn converted under the same ownership to City Supermarket along with a sister store in nearby Irvington. The location in Newark is bigger, certainly, than Irvington. I don't know my Newark neighborhoods but this is somewhere around Ivy Hill or Vailsburg. This overview of the store gives us a good look at the entire storefront. This was taken from JoshAustin610 on Flickr. The entrance and exit are on the right, where the light post is. You enter closer to the parking lot and walk across the front-end to the grand aisle, which is on the side where "a city of savings" is on the facade. It's kind of a strange layout, but it works OK.
My picture from August 2017 shows that the facade has been repainted. The text on either side of this main part is gone, and while it looks cleaner, it's awfully boring. You walk in front of the stacks of rice, then enter the grand aisle to the left of the rice. Customer service is behind the rice, with registers to the right. In the front left corner is a small floral department and café, followed by a large hot food counter and salad bar, then the deli. Bakery is in the back left corner, with seafood and meat along the back wall. A look up towards the entrance. You enter the sales floor where the windows are. The floral department and café are under the picture of flowers. Looking at deli from produce. This store is much nicer than I had expected. City (at the time Super Fine Fare) gutted the entire building and really did a great job. The high ceilings make the fairly small store feel extremely spacious. Looking towards prepared foods and deli. It's a very impressive grand aisle with more services than I had expected. Bakery is in the back corner, although they don't bake in-store. (Extra doesn't even pretend to have a bakery.) I do like the curved wall in the corner here. This was kind of strange, though: the refrigerator case to the left had cheese in it, and the refrigerator case just off-camera to the left had cakes. So why are the cakes in the deli and the cheese in the bakery? Service seafood and meat along the back wall. I love how the walls all have vibrant colors on them. It makes the store feel very alive. Seafood on ice and meat in the case. Packaged meat along the back wall, dairy and frozen in the last aisle. Frozen continues along the front wall after the end of the registers. I've seen fresh-pasta bars at gourmet stores and placed like Whole Foods, but a freezer with a few boxes of loose tortellini in a grocery aisle is a new one for me. (They also labeled it ravioli. Oops.) I'd be willing to bet this comes from a producer in Newark or the immediate area, although there wasn't a sign. The storebrand here, if anyone is interested, is Parade. Not a huge fan of the floor, and it was not in as good condition as Extra's, but it's OK. It matches the decor well. I do like the shelving with the beams in front. More and more stores are using that instead of the traditional shelving with everything behind. I've also seen some stores with even nicer shelving with lights along the top. Dairy int he last aisle. Frozen foods run along the front wall. Looking towards the floral/café area above. The registers are beyond the freezer cases. Pretty small front-end for a store that feels as big as this. Also one of the few stores I've been in with TVs for the customers' entertainment. I expected the other side to be security cameras -- nope! I guess if you get bored waiting in line it's handy! Courtesy of an outdated blog run by the Super Fine Fare, we can get a look at their circular from 2011! Click on the pictures to enlarge or download. Pretty cool. Some prices haven't changed much in almost seven years. City is very nice but lacks the neighborhood charm that Extra has. Extra doesn't have the selection that City does, though, but I think Extra's prices are lower. Both use Parade storebrands. 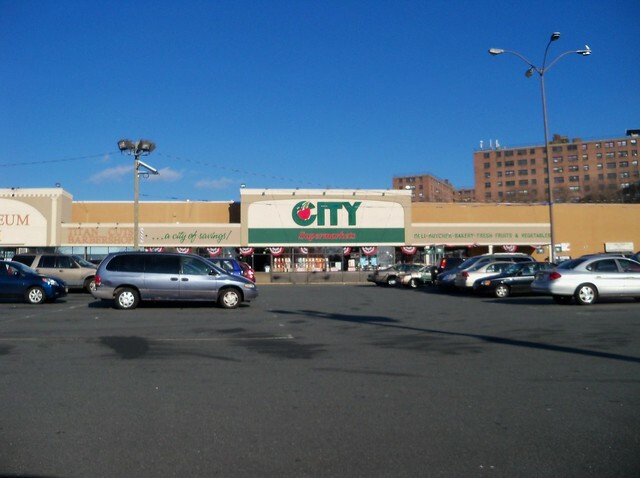 Was this store something before it was a City Supermarket? The flooring looks oddly similar to the Acme/Albertsons Marketplace or "Santa Fe" renovations. Also, What did you think of the decor? I find it kind of interesting with all the words on the wall at the deli department; which reminds me of Acme's reusable bags from a few years ago, when they were rolling out the "Something More For Less" motto to their stores. 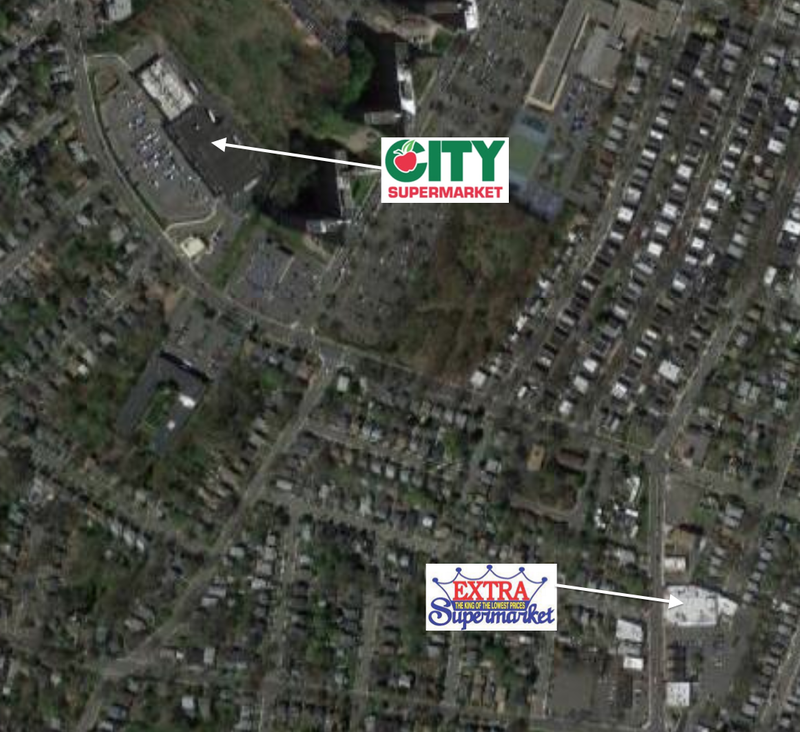 It was built as a Stop & Shop, then switched to A&P, then Foodtown, then Fine Fare, now City. However, the decor was installed by Fine Fare (with the same owners as City). But it is a stock decor package, so you'll see the same decor in other stores like the Ideal Food Basket in Baldwin, NY, for instance. Personally I really like the decor and I think it works especially well with the high ceilings -- it's slightly less successful, at least based on photos, than the smaller Irvington location --that this store has. 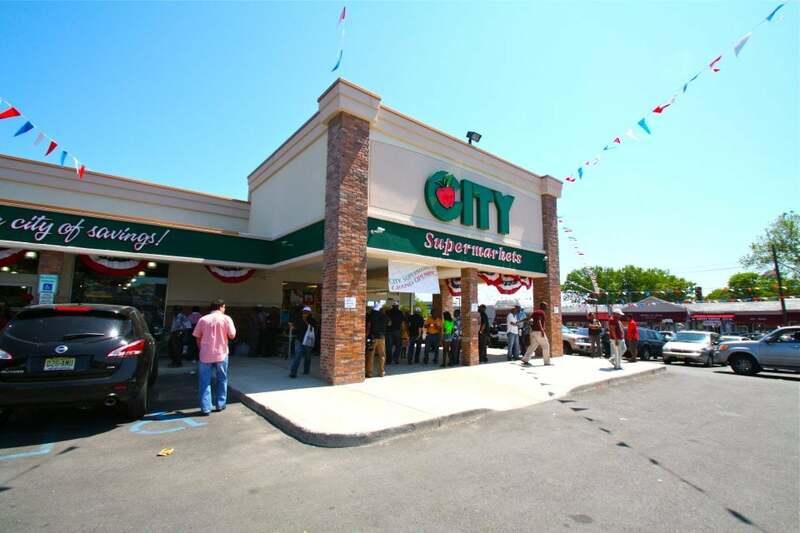 Happy Birthday to NJ Supermarkets! Snapshot: Old GU in Kingston!